Available as Hard Copy or E-Book. First published in 1985 this remarkable book has stood both the test of time and peer review, to become a classic amongst specialists in the human origin subjects. As archaeological science has broadened its base, to cover many new and exciting disciplines, it is primarily the solid evidence on the origins and spread of agriculture and pastoralism, genetics and language, which take us with some confidence with the O'Briens to Southern Lebanon before 8,000 BC. The Genius of The Few in quality hardcover. 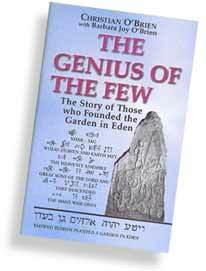 The Genius of The Few - Book Review...... Recommended reading. Who designed the great stone monuments of Avebury Ring, Stonehenge and Silbury Hill? It was this question that prompted a long line of enquiry that led initially to the Middle East and the Lebanon and then to other parts of the world. In this superb lecture Christian and Joy O'Brien present the findings of that research that formed the basis of the book The Genius of the Few and has led to the posing of a whole new set of questions regarding the common origins of humanity, the Old Testament, the accounts of Enoch and the garden of Eden. Incredible research which provides proof of the advanced civilization in the archaic world. Digitised lecture by Christian and Joy O'Brien presenting the findings of their research.